This custom deck of playing cards features Mythical Creatures from Greek, Norse, Egyptian and East Asian traditions. Each suit represents a different pantheon and includes symbols and iconic elements from each. 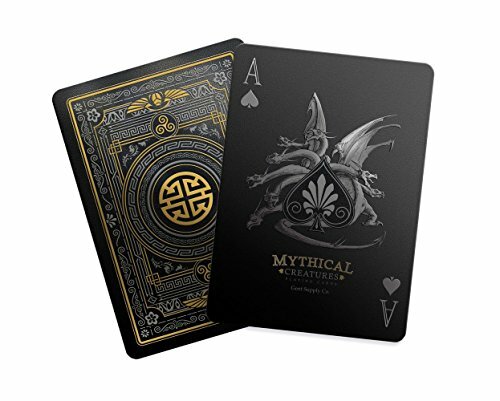 This deck includes 52 cards plus two unique jokers and a card identifying all the Mythical Creatures. This deck was illustrated by Gustavo Borboa. Custom deck of playing cards featuring Mythical Creatures from Greek, Norse, Egyptian and East Asian traditions. Hand drawn artwork, unique custom face cards and custom pips. If you have any questions about this product by Gent Supply, contact us by completing and submitting the form below. If you are looking for a specif part number, please include it with your message.